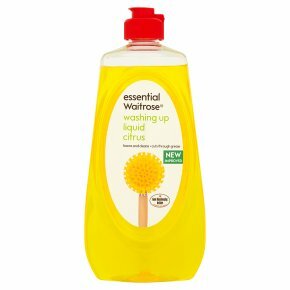 This washing up liquid cuts through grease and grime instantly, leaving a sparkling finish on your dishes. Its outstanding performance will remove even the toughest greasy food remains. Long lasting bubbles are released to achieve brilliant results on your pots, dishes and pans. Its light, clean, fresh scent will leave your kitchen smelling great while doing the dishes. INGREDIENTS: ANIONIC SURFACTANT (200465) (Aqua (water), Sodium Laureth Sulfate, Sodium Hydroxide), AMPHOTERIC SURFACTANT (6967) (Aqua (water), 1-Propanaminium, 3-amino-N-(carboxymethyl)-N,N-dimethyl-, N-(C8-18 andC18-unsatd. acyl)derivs., hydroxides, inner salts), AQUA (1078) (Aqua (water)), HYDROTOPE (1141) (Aqua (water), Sodium Xylene Sulfonate), NO IONIC SURFACTANT (7161) (PEG-80 Glyceryl Cocoate), SOLVENT (8925) (Isopropyl Alcohol, Alcohol Denat. ), PERFUME (6795) (Perfume), PRESERVATIVE (4074) (Aqua (water), Methylisothiazolinone, Benzisothiazolinone), STABILIZER (2895) (4-hydroxy-2,2,6,6-tetramethylpiperidinoxyl), UV FILTER (Benzophenone-3), DYE (1240) (CI 47005, Sodium Chloride), DYE (4936) (CI 19140).